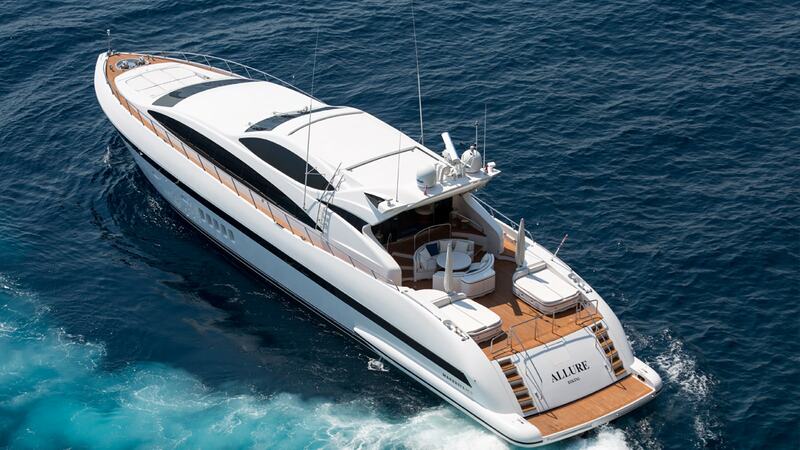 Allure is 31.40m luxury sports motor yacht that can accommodate up to nine guests in four well appointed cabins. Helmed at the deck by an experienced captain, guests can truly enjoy what the yacht has to offer in terms of cruising grounds and local knowledge. A highly stylish bespoke yacht with sleek lines, she boasts a maximum speed of 32 knots and a cruising speed of 28 knots. Allure is a spacious yacht with ample outdoor and indoor living areas. She was refit in 2015 and is in impeccable condition. Allure features an elegant and fresh interior and is beautifully decorated. Wood and marble are a common theme throughout the yacht. She has three double cabins, a twin cabin and a pullman berth that can comfortably accommodate nine charter guests. The yacht also boasts large exterior living spaces with plenty of deck areas for formal dining or sunbathing. The impressive swim platform is one of Allure’s winning points . The yacht has a rich selection of water toys and diving equipment, including a diving air compressor. Guests who are interested in learning how to dive, can benefit from the Diving Instructor on board. Allure’s professional crew of four will make sure that charter guests have an unforgettable time on board.